Created for the HUB space at the Performa 11 Biennial and curated by Esa Nickle. 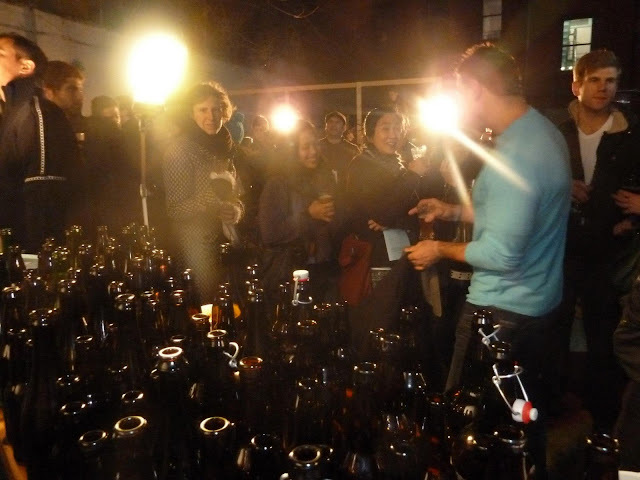 A two-night exhibition in the form of a pop-up pub that celebrated the work of approximately twenty-five New York City homebrewers. The brewer's were commissioned to create beer specifically for the bar, and a resulting thirty-three beers were made. The brewers ranged in experience, from the seasoned veterans to those who have only made a few batches. Special glassware was made for the all-you-can-drink event, along with a twelve page catalog that had detailed information about each beer and brewer. Each brewer was present and available for conversation. All beer was displayed in pitchers on the shelf with the menu projected above it. People ordered at the bar and volunteer bartenders poured drinks all night. Kegs and bottles were also displayed on the floor and along the bar.